Mr. Harold J. Cassidy has engaged in a broad variety of litigation, both trial and appellate, in his 40 years in the private practice of law. 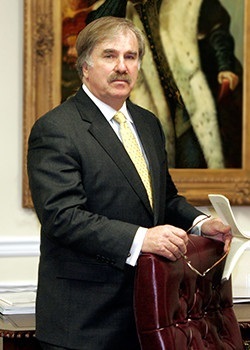 Mr. Cassidy was designated by the New Jersey Supreme Court as a Certified Civil Trial Attorney, and is a past member of the Board of Governors of the Association of Trial Lawyers of America, New Jersey. He was selected by the New Jersey Governor to serve as a member of the New Jersey Bioethics Commission, and was a Delegate to the American Bar Association convention on Life, Death and the Law. He has been honored for his achievements in the law by being selected Person of the Week by the ABC World News with Peter Jennings, and has recently been selected as one of New Jersey’s top attorneys in the field of general litigation by New Jersey Monthly and New Jersey Superlawyers magazines, being one of approximately 60 attorneys (out of 55,000) selected in that category. At the end of the twentieth century, a prominent publishing house distributed a work on the one hundred most important legal cases of the twentieth century. Two of Harold J. Cassidy’s cases were listed and discussed. No attorney had more cases listed. Harold J. Cassidy has litigated numerous cases of public importance in a variety of areas of practice. In the area of criminal law he was counsel in the New Jersey Supreme Court’s leading case which established the right of one accused of a crime to have independent legal counsel. He litigated the first case in the nation in which an Appellate Court established the right of a defendant, in a cross-racial identification case, to require the state to hold a line-up which would include specifically identified non-defendants. Mr. Cassidy was also a member of the legal team which helped win Rubin “Hurricane” Carter, a well-known professional boxer wrongfully convicted of triple murder, his freedom in court proceedings which lasted nineteen years. Mr. Cassidy’s involvement spanned eight years. In the area of medical legal and tort law, Harold J. Cassidy handled more than a thousand different civil actions involving personal injury, product liability, medical malpractice and general negligence cases. Cases of public interest included Mr. Cassidy’s obtaining the first jury verdict in New Jersey in which a jury returned a liability verdict against a doctor and nurses for suicide death of their psychiatric patient. Harold J. Cassidy also was counsel in the New Jersey appellate case that created a new rule of law which tolled the commencement of the statute of limitations in cases where a minor was sexually assaulted and the resultant psychological injury prevented the victim from timely asserting her rights. He obtained significant recoveries in novel cases such as the Hudson County Jail Fire Case, and the Breach of Security case at the State University. Mr. Cassidy recently established important precedent in an abortion malpractice case which established for the first time, anywhere in the nation, that a first trimester abortion involved the death of a family member, and the question of whether such an abortion terminated the life of a living human being was a question of fact for a jury to determine. Harold J. Cassidy has engaged in substantial commercial litigation practice. His firm was counsel to the governmental banking regulatory agencies and he successfully defended, on behalf of the FDIC, the first post-bank closing due process hearing in the history of New Jersey. He was also counsel in the case in which the New Jersey Supreme Court struck down certain state fees upon federal agencies as violative of Federal Law and the Supremacy Clause. Harold J. Cassidy distinguished himself as a defender of the rights of pregnant mothers in a variety of matters over a period of more than twenty years. He secured the return of mothers’ children in situations where the mother’s rights were violated and her surrender of her constitutional rights were uninformed or involuntary. He was Chief Counsel in the famous Baby M case, the first case in the United States to strike down surrogate parenting contracts as illegal, unenforceable, against public policy and exploitive of women. Most recently Harold J. Cassidy has devoted his practice to protecting the rights of pregnant mothers, particularly in matters involving abortions where abortion providers have violated the rights of the mothers and subjected them to procedures without obtaining informed and voluntary consent. He has established important precedent in this area of practice. He is now widely consulted by various state legislatures for his legal expertise in the area of mother’s rights and abortion law and he has assisted in drafting and defending legislation in this area. Mr. Cassidy has lectured widely on the rights of women including addresses at the Harvard Law Forum, Yale Law School and Princeton University. He has appeared on National and International television, including appearances on Nightline, The David Brinkly Show, and the David Frost Show in London.